This week, the University Professional and Continuing Education Association (UPCEA) hosts its annual conference, a summit dedicated to advancing the leadership of those supporting online and adult learners. In honor of UPCEA, we bring you the story of a leader in career services for professional and continuing education who has successfully transformed career support for her students. Jessica Oviedo is the career champion of nearly 40,000 students. As Manager of Career Services for UCLA Extension, Jessica fills the only position solely dedicated to the career advancement of Extension students. Though these 40,000 individuals pursue learning in 100 different academic programs and span the full range of demographic diversity, each and every Extension student has access to robust, customized career support. 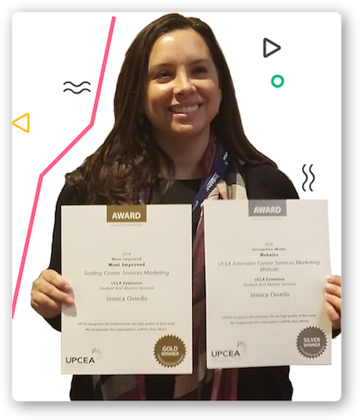 For achieving this prodigious feat, Jessica accepted two awards on behalf of UCLA Extension at the UPCEA MEMS conference in December 2018, a Gold Medal for Most Improved: Scaling Career Services Marketing, and a Silver Medal in the Interactive Media category for their career website, which is powered by uConnect. As a data driven organization, UCLA Extension’s leadership has always derived key insights about their students' motivations from surveys religiously administered, before, during, and after enrollment. 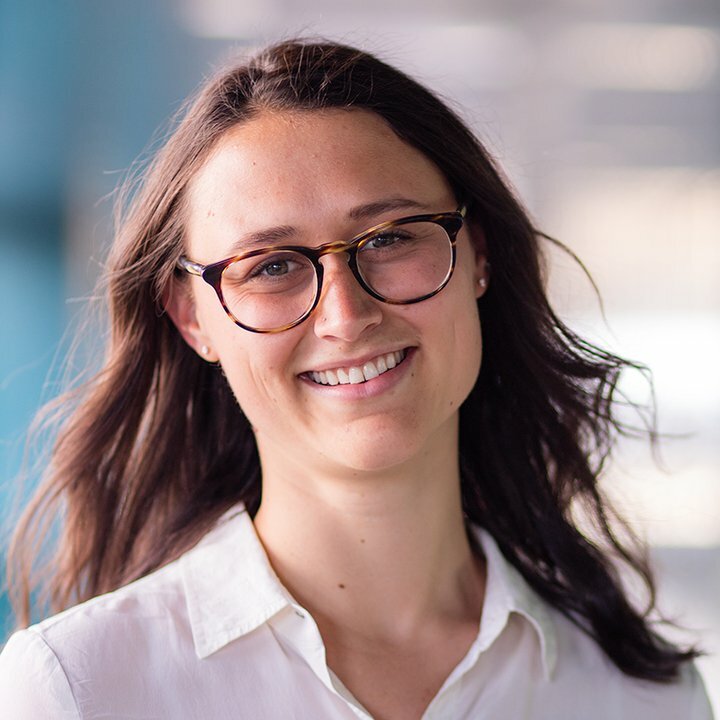 Finding ‘Career Advancement’ as a recurring top motivation, UCLA hired Jessica as the Manager of Career Services in August, 2016 to provide students with the support services they needed and were beginning to expect as part of their UCLA Extension experience. Recognizing that she was tasked with providing 40,000 students with personalized career support, Jessica knew she needed to provide self-guided access to career resources in order to effectively scale her efforts. In 2017, UCLA partnered with uConnect to implement it’s career services hub for online and adult learners behind Jessica’s vision and the leadership of then-Dean of UCLA Extension, Wayne Smutz. The uConnect implementation not only provided adult learners a dedicated home for career resources and support, but also gave the UCLA Extension team a platform to integrate resources UCLA was already offering across campus, in order to extend those tools to Extension students. UCLA has always offered their students valuable career resources, including a job board, coaching platform, and other career planning tools. Without a way to promote these resources to Extension students, however, awareness and utilization of them among adult learners was limited, at best. Shortly after the uConnect launch, Jessica forged a partnership with UCLA’s main campus Career Center to provide her students access to the opportunities hosted in their Handshake job board as well as other valuable career information offered by UCLA’s on-ground career services. Since the launch of their uConnect platform, Jessica and the UCLA Extension team have leveraged their career site to implement an ‘ecosystem’ approach to delivering career services. This approach is anchored in making career resources and information easily accessible to not only students but also, importantly, faculty, advisors and staff so that they may serve as an extension of Jessica’s efforts - referring resources and providing intentional career guidance to students in their daily interactions. Current and prospective students, faculty, staff, and even admissions teams can now access career information and resources anytime on the public-facing platform. No longer are these resources hidden from online and adult learners, and overlooked as tools to help inform academic pathways and help students advance their careers. Visitors can browse jobs, events, career advice, and resources grouped by specific pathways, presented in the 13 digital ‘Career Communities’ on the platform, serving as a destination for esteemed faculty and alumni to publish advice and insights about the ‘Future of Work’ aligned to specific career communities. And for those who aren’t actively visiting the site, uConnect’s intelligent recommendation system will send personalized alerts with tailored recommendations of career content specifically relevant to each user’s interests. Jessica’s leadership and work championing the career service needs of her students has seen immediate and tangible results. In the first year alone, Extension’s uConnect platform saw over 150,000 visits. And after using uConnect’s pre-built integrations with tools like Handshake the number of Extension students applying to jobs increased dramatically. Jessica’s efforts are resonating within the continuing education community and beyond. Delivering a robust career services experience is quickly becoming a requirement to recruit and retain online and adult learners, and Jessica’s work is an example of a small team making a big difference for today’s learners. For more insight about what professional, online and continuing education programs are doing to provide career services for their students, visit our website or email us at info@gouconnect.com.